On the surface of it, the curving lines in Asheville artist Kenn Kotara’s paintings and sculptures are abstractions, lyrical studies in the division of space. But dig a little deeper, and you’ll find that at its roots, the work is grounded in observations of nature and the current of math and geometry that runs through all natural forms. A native of Lake Charles, Louisiana, Kotara studied architecture as an undergraduate. 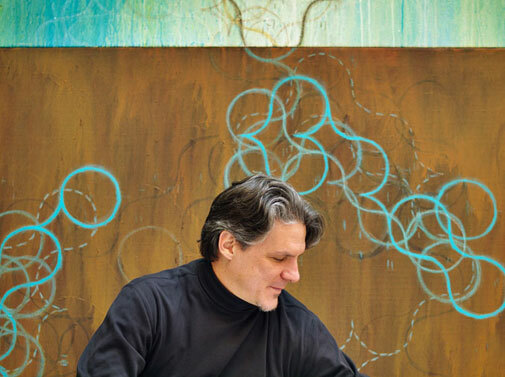 He moved to Western North Carolina in 1997 to work as a graphic designer with a friend’s company, but soon started experimenting with painting and pastel drawing on paper and eventually went back to school for an MFA in Studio Art. Work as a graphic designer did not allow him to have free time. While transitioning from graphic design to fine art, Kotara retained a designer’s affinity for pattern and abstract form, an architect’s grounding in geometry and line, and his own fascination with the natural world, from microscopic forms invisible to the naked eye to the swirl of a hurricane seen from a satellite far above the earth. Kotara’s distinctive works on paper, canvas, Mylar, and screen have gained attention both nationally and internationally, and his work has been included in over 80 exhibitions and is housed in the permanent collections of museums including the Louisiana State Museum in Baton Rouge and the Asheville Art Museum. Locally, his work can also be seen at Gallery Minerva. Kotara’s Barbe espagnole (Spanish moss) series evokes the swaying motion of the iconic moss familiar to all Southerners, but interprets the form and movement in a range of media, a spectrum of color and varying degrees of density. While a hint of the original inspiration may still be detected, the work is just as likely to suggest to the viewer entirely different, but equally iconic forms – plumes of smoke, strands of DNA under a microscope, ripples on the surface of water. By taking a single image – the graceful, curved line – and rendering it in such a variety of ways, Kotara focuses attention on how media and technique can re-articulate it. It can be obscured under layers, called to the forefront with vivid colors, blurred, sharpened, dissected or clustered. Rather than appear repetitive, the image becomes infinitely mutable. “What I love about him as an artist is that he’s always pushing himself, taking his ideas and looking in every direction and trying every media,” says Nancy Sokolove of the Asheville Art Museum. Kotara’s recent three-dimensional work is a perfect example of his boundary-pushing in action. Kinetic sculpture created from strips of window screen connected with wire and hardware, the pieces are meant to be suspended from a ceiling in a space where they can be observed from all sides. Kotara says that while doing a home addition that included a screened-in porch, his attention was drawn to the rolls of window screen used in the process. “I don’t fabricate my own materials, so I’m interested in how I can use what’s already out there,’ he says. Fiberglass screen, he discovered, had many appealing qualities that lent itself to the kind of work he was doing: it’s translucent, it holds paint, it’s flexible, and best of all, it can be layered. Kotara experimented with different ways to manipulate strips of screen – cutting into and painting on them – then different ways to layer and display the screens, from attaching them to wire with clothespins to dangling them from hangers on a coat rack to suspending them at equidistant points on a wire-and-hardware base he created himself. There are even a few pieces built using tomato cages as armatures. At first, Kotara says, he anchored the screens on the top and bottom, but now he lets the lower end move freely, allowing the screens to respond to the environment they’re in: the rush of air as a viewer walks by or the swivel of the wire on the hardware from which they’re hung. The sculpture is something of a departure from the sometimes dreamy, sometimes pulsing nature of Kotara’s paintings and pastel works on paper, and yet there are common threads between the two lines of work: the undulating, circles painted onto the screens, the complex layering that draws the viewer in but doesn’t dictate any clear conclusions. Sokolove selected one of Kotara’s screen sculptures for inclusion in the Asheville Art Museum’s upcoming Homage 2, an exhibition dedicated to artists’ interpretations of the square (and a nod to the influence of Black Mountain College professor Josef Albers and his work of the same title). Despite the seemingly limiting construct of the square, Kotara explores curvilinear forms within its confines and depth through the successive layers of screen, inviting the viewer to look closer, through and in between each layer. That ability to dig deeper is part of what makes Kotara an exciting artist, one Sokolove says, we can expect to continually push the boundaries of his work. Kenn Kotara will co-host a lunchtime tour of the Asheville Art Museum’s permanent collection along with artist Steven Seinberg on March 11 at noon. Homage 2 opens October 1 at the Asheville Art Museum’s Gallery 6. Visit kotarastudio.com for more info.